There is something magical about a handwritten recipe card, as if it carries with it little pieces of the souls of all the hands that have touched it and all the celebrations its ingredients have welcomed. The most powerful recipe cards are the ones written in the cursive hand of someone — usually of a relative, perhaps several generations back and now deceased. It sparks an instant connection to the past. 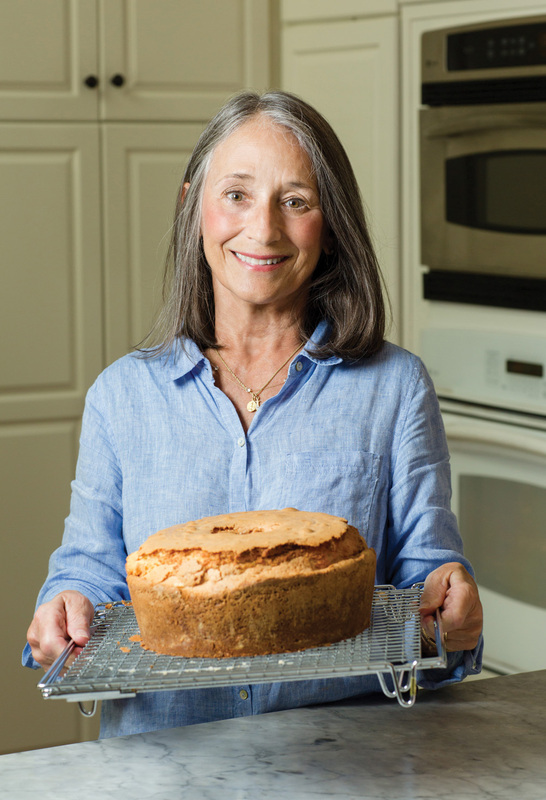 When MB arrived at the home of Tricia Williams in Montrose to take a look at her famous pound cake, her binder of handwritten recipes was laid out on the counter, a chronological record of all the celebrations she has witnessed through the years with her family. There was the teapot cake recipe she once made for her mom; the chocolate ganache recipe she goes back to time and time again; the birthday cakes for each child’s birthday with notes about the event. There are plenty of recipes printed from websites and photocopied from cookbooks, but the truly magical ones are all handwritten. This particular day is baking day. Despite a week so hectic it could make your head spin, Tricia had baked a Lane cake, a chocolate layer cake, some chocolate crinkle cookies and a glorious, mile-high pound cake. She explained that all her children’s birthdays fall in the same week, and she always makes their cakes from scratch. Today was the day to knock the baking out. This pound cake is not ours at all but made with love for her daughter Raine’s 35th birthday. Tricia always uses the same recipe from “Little Rock Cooks,” a cookbook by The Junior League of Little Rock, Arkansas, where she lived as a newlywed. The cookbook was a gift from a friend in 1972, and it has been the gift that keeps on giving. Each of the following recipes represents the time-honored tradition of bringing home-cooked food to those we love. Sometimes we head to the kitchen for joyous occasions — such as a birthday or birth of a baby. But we also cook as a show of support during an illness or death in a family. These five home cooks share their go-to recipes for such occasions, made with love and full of comfort or joy, ready to pass along. MB Tip: Handwrite a small tag giving the recipient instructions on how to best freeze or reheat your dish, just in case they are inundated with food and need to save something for later. Recipe adapted from “Little Rock Cooks,” a cookbook by The Junior League of Little Rock, Arkansas. 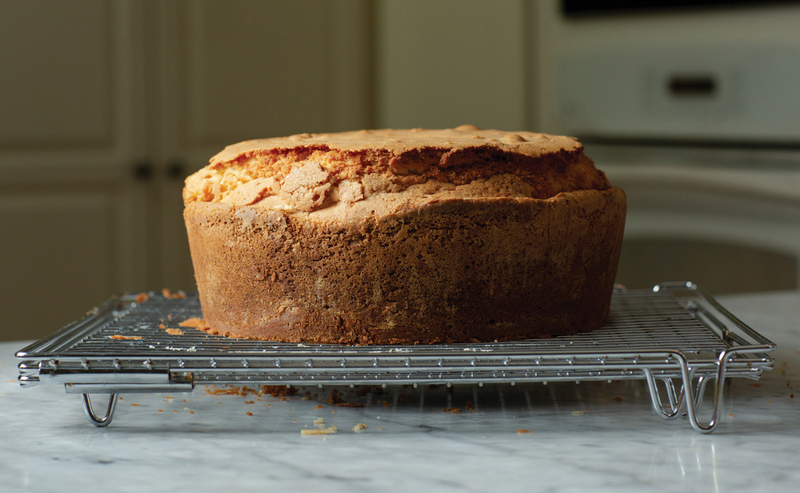 Tricia adds almond extract to all her baked goods when she can, and it adds the perfect extra punch of flavor to this pound cake. 1. Preheat oven to 325 degrees. In the bowl of an electric mixer, cream butter and sugar until light and fluffy. Add eggs, one at a time, beating well after each addition. 2. Mix dry ingredients in a separate bowl. Gradually add dry ingredients to mixer, beating well. Add vanilla and almond extracts. Fold in sour cream just until combined. 3. Grease and flour a 10-inch tube pan or two loaf pans. Pour batter into pans and bake for 1 hour and 10 minutes, or until golden brown on top. Let cool slightly before gently removing from pan, then let cool completely on a wire rack. Serves 12. Sometimes the best advice is to keep it simple. Caitlyn Waite is an accomplished home cook, and before kids she loved the challenge of a complicated recipe. 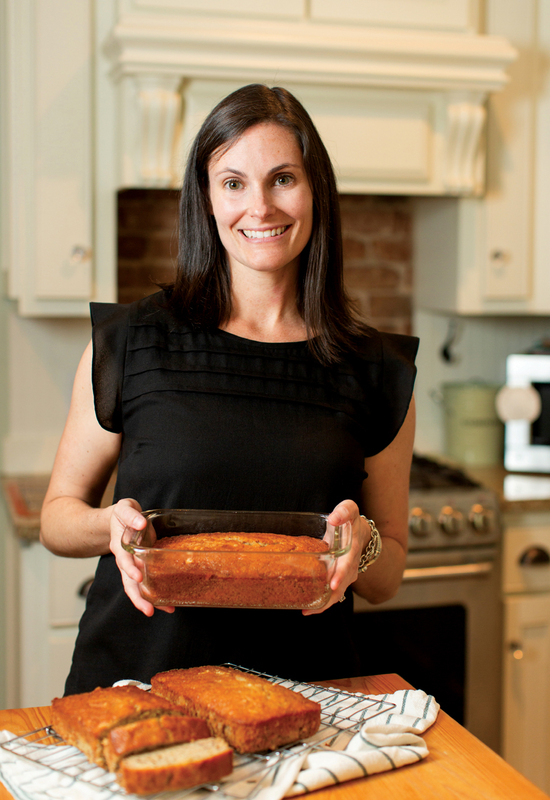 But these days, with two kids and a busy schedule, she looks for hassle-free recipes. Any time she takes food to a friend who is sick or has a new baby, she bundles the dish with paper plates, paper napkins and disposable cutlery. Her lima beans and rice recipe is quick to reheat one bowl at a time, and is also quick for Caitlyn to pull together. 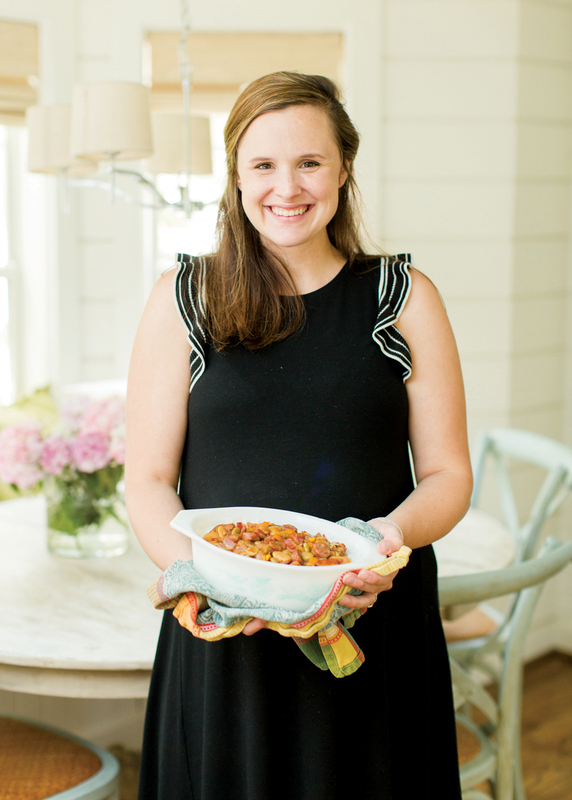 She adapted it from a red beans and rice recipe, saying that she personally doesn’t love red beans, so she came up with her own creative twist on the homey dish. Amidst a sea of casseroles, a meal like this is a welcome change. When she is not putting her creative twist on modern-day recipes, Caitlyn loves to pore over the scrapbook her grandmother made for her as a wedding present — it contains all of the old family recipes, including the famous cheese wafers that were favors at Caitlyn’s wedding. Some family recipes are too good not to share! MB Tip: To simplify the process for yourself and your recipient, deliver meals in throw-away aluminum pans. They won’t have to wash anything and you won’t have to wait for a return! Recipe adapted from “Love Welcome Serve” by Amy Nelson Hannon. 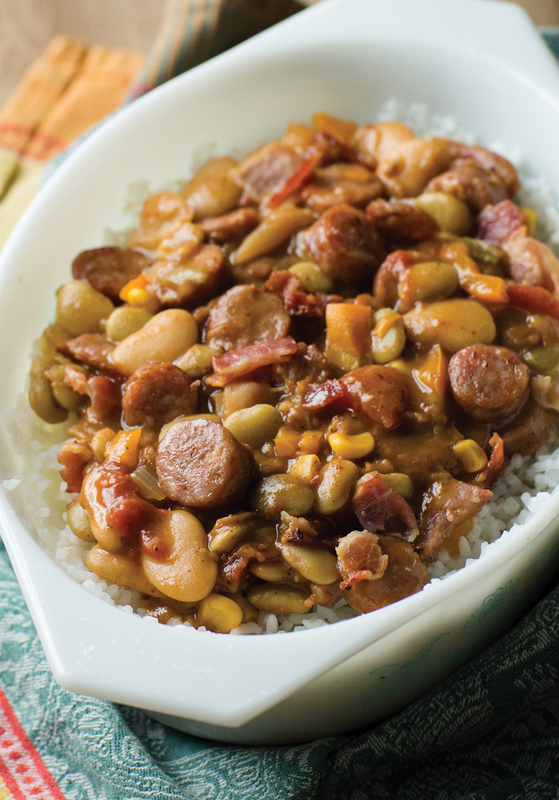 Caitlyn swapped the red beans for limas in this quick and easy recipe that feeds a crowd. Don’t forget the throwaway container! 1. Preheat a large saucepan or pot over medium heat. Brown the sausage and transfer to a plate and cover. In the same pot, cook the bacon until crispy. Drain on a paper towel-lined plate, reserving the grease in the pot. 2. Reduce the heat to low. Add bell pepper, onion and garlic, and saute in the bacon grease until translucent. 3. Sprinkle flour over vegetables and cook for 2 – 3 minutes, until flour is cooked. 4. Pour lima and butter beans, okra mix and stock over vegetable roux. Add creole seasoning and salt and stir to combine. 5. Simmer for 15 – 20 minutes, stirring occasionally, until thickened. 6. Return sausage and bacon to the pot and stir to combine. Remove from heat and stir in cooked rice. 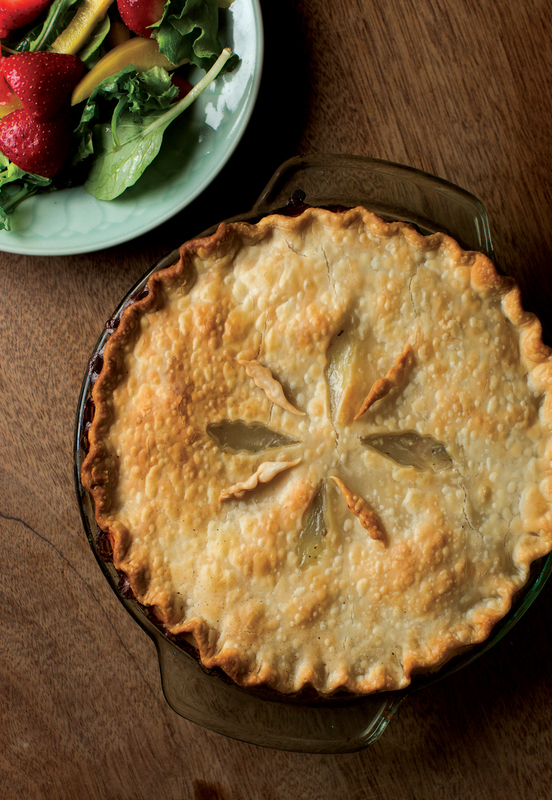 Nothing says comfort like the smell of a chicken pot pie warm from the oven. Nothing says pure love like heart-shaped steam holes carefully cut out of the pastry crust. Jan Osmon makes everything with love and shares with abundance. 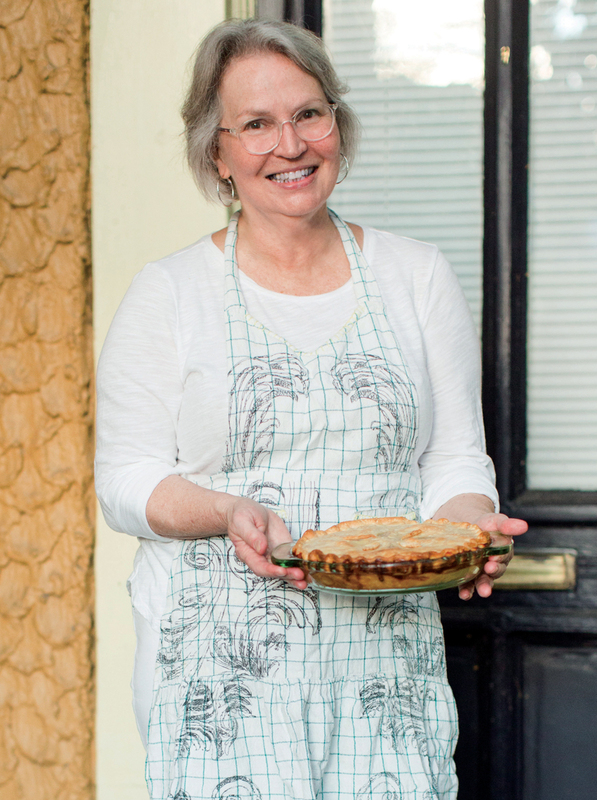 She and her sister both make the same chicken pot pie recipe anytime there is a new neighbor to welcome, a baby to celebrate or a sickness or death in the family. A warm meal that’s a cinch to pull together is sometimes just what the doctor ordered. This recipe can be made the old-fashioned way — fresh vegetables, slow-cooked chicken and pastry made from scratch. It can also be thrown together in a pinch with rotisserie chicken and refrigerated pie crust. Both versions are a welcome treat. Jan once gave this dish to a dear friend whose mother had passed away. Her daughter had one taste and begged for the recipe. Jan obligingly shared, and added a miniature heart-shaped cookie cutter so her friend’s daughter could make the same sweet steam holes. The dish is now a hit on the other family’s dinner table, too. The love keeps going ’round and ’round. MB Tip: If you’re delivering a warm meal, wrap it in a thrift store or estate sale towel. The dish will stay warm and the recipient will then have a gift that they can use time and time again. In a pinch, this recipe can be made with rotisserie chicken from the deli and refrigerated pie crust. 1. Preheat oven to 350 degrees. Spray pie plate with cooking spray. Line pie plate with bottom crust and add bite-sized pieces of diced or shredded chicken. 2. Mix cornstarch with water to form a thin paste and stir into chicken stock. Cook in a saucepan over medium heat until desired thickness is achieved. Cool completely. 3. Add hard-boiled eggs to chicken pieces along with peas and carrots, if using. Add salt and pepper and herbs de Provence. 4. Pour the cooled, thickened broth over chicken mixture and seal with the top crust. Flute the edges. Use small cookie cutters to make two or three steam holes. 5. Bake 30 – 40 minutes and serve warm. Serves 6. Hollie MacKellar was born and raised on the Eastern Shore and has a large group of lifelong friends within close reach. When her mom was diagnosed with cancer in 2013, these same friends rallied around her and her family, spoiling them with love, many cases in the form of food. She knows a thing or two about bringing a casserole or baked good to a friend in need, having been on the receiving end so many times. 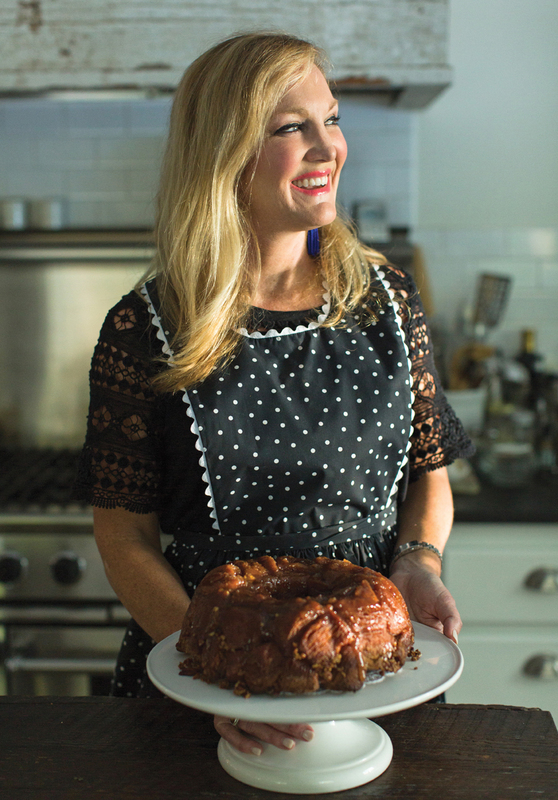 Hollie says her mom never had the time to master complicated recipes when they were growing up, but later in life, a part-time job at Williams Sonoma introduced her to a whole new world of food. She poured herself into the recipes, ingredients and gadgets that the gourmet retailer is known for. 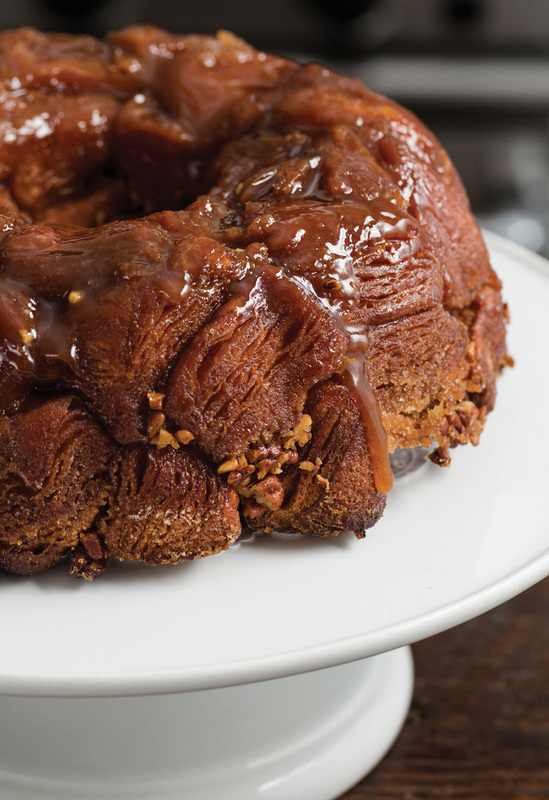 Hollie’s mother’s monkey bread recipe, however, is ridiculously simple and completely addictive. It’s perfect for casual eating — just pull off a piece and enjoy — making it ideal when folks are too busy or too distracted to sit down at the breakfast table. Everything looks a little cheerier with one of these on the kitchen counter! MB Tip: Think of dishes that store well at room temperature or reheat in the microwave easily. With a new baby or family tragedy, you often want to grab a quick bite at an unusual time of day (or night!). 1. Preheat oven to 350 degrees. Grease a 12-cup fluted tube pan with shortening or cooking spray. In large-storage plastic food bag, mix granulated sugar and cinnamon. 2. Separate dough into 16 biscuits; cut each into quarters. Shake in bag to coat. Arrange in pan, adding pecans to the biscuit pieces. 3. In a small bowl, mix brown sugar and butter. Pour over biscuit pieces. 4. Bake for 30 – 35 minutes or until golden brown and no longer doughy in center. Let cool in the pan for 10 minutes. Invert onto serving plate and serve warm. Serves 10. Amelia Bobo has deep roots in Alexander City, Alabama. Her four-times great-grandparents were some of the original settlers there, and she counts the town’s second mayor as family. Amelia loves to browse her great-grandmother’s recipe book, much of which was taken from the Alexander City Methodist Church cookbook. 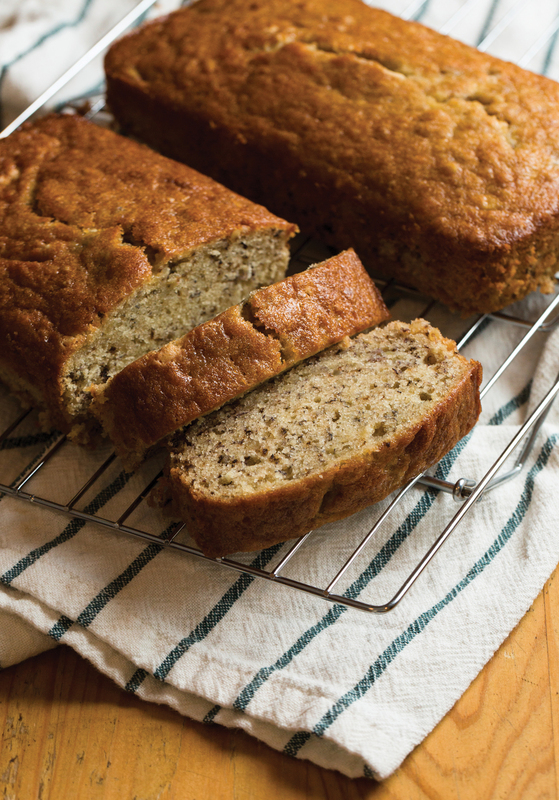 The banana bread is a favorite. Amelia says a warm loaf makes a perfect breakfast, snack or dessert. It’s easy to grab a piece on the go when life is crazy and time is short. When baking for her own family, though, she likes to switch out the white flour for whole wheat and reduce the amount of sugar, saying her family is none the wiser. However, you can’t go wrong when you stick with an original — this one is a blue ribbon winner from the Baldwin County Fair! Amelia laughs that as a newcomer to the area a number of years ago, she got a wild hair and entered the recipe in the baking contest — something completely out of character for her to do. The rest is history, and you should definitely add this one to your recipe files. MB Tip: Write the ingredients of your dish on a tag! That way, your recipient knows if nuts, dairy, gluten, soy or other allergens and irritants are in your dish. 1. Preheat oven to 325 degrees. Cream butter and sugar with an electric mixer. Add eggs and beat well. Add buttermilk and vanilla and combine. 2. Combine flour and baking soda in a separate bowl, then alternate adding flour and bananas to butter-sugar mixture. When completely combined, fold in nuts. 3. Lightly grease 3 medium-sized loaf pans and fill with batter. Bake for 45 minutes – 1 hour, or until a toothpick comes out clean. Makes 3 loaves.